When the leaders of the G8 countries gather June 17 and 18 in Northern Ireland for their annual tête-à-tête, their economic dialogue will largely be a tale of woe: poor economic performance that has severely eroded public economic confidence in most of their countries. But individual leaders face contrasting challenges. There are growing public expectations, especially in Japan and the United States, that the economy will improve soon, raising the stakes for both President Barack Obama and Japanese Prime Minister Shinzo Abe. At the same time, Canadian Prime Minister Stephen Harper and German Chancellor Angela Merkel, who faces re-election in September, have publics with relatively low expectations of further economic improvement. The preponderant view among publics in the G8 nations is that there will be no change. The average growth rate of the eight—Canada, France, Germany, Italy, Japan, Russia, the United Kingdom and the United States—in 2012 was 1%, according to the International Monetary Fund. And projected growth in 2013 is no better. It is little wonder then that in March only two of the eight countries—Germany (75%) and Canada (67%)—did a majority think their economy was doing well, according to a Pew Research Center survey. But the assembled leaders are under mounting pressure from the rising expectations of their constituents to outperform those economic projections. 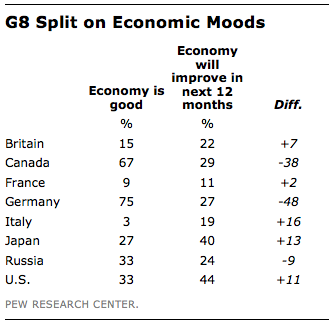 In four of the G8 nations, public expectations that the economy will improve over the next 12 months are up compared with current economic perceptions. Most notably, while only 27% of Japanese say the economy is doing well today, 40% expect it to improve over the next year. And while just 33% of Americans think their economy is good, 44% expect it to do better. The expectations game is playing out differently in Canada and Germany. Fully 67% of Canadians think their economy is doing well (and it grew 1.8% in 2012) but only 29% think it will improve over the next 12 months. A plurality, 47% of Canadians, thinks the economy will stay the same. In Germany, 75% think the economy is good (although it grew by only 0.9% in 2012) and just 27% think it will improve over the next year, while 49% believe it will not change. But the status quo in Germany is not nearly as good as the status quo in Canada. It has long been a G8 tradition that each leader holds a separate post-summit press conference to tailor the results for his or her domestic audience. Given the widely differing public expectations going into the summit, that tradition may well continue.